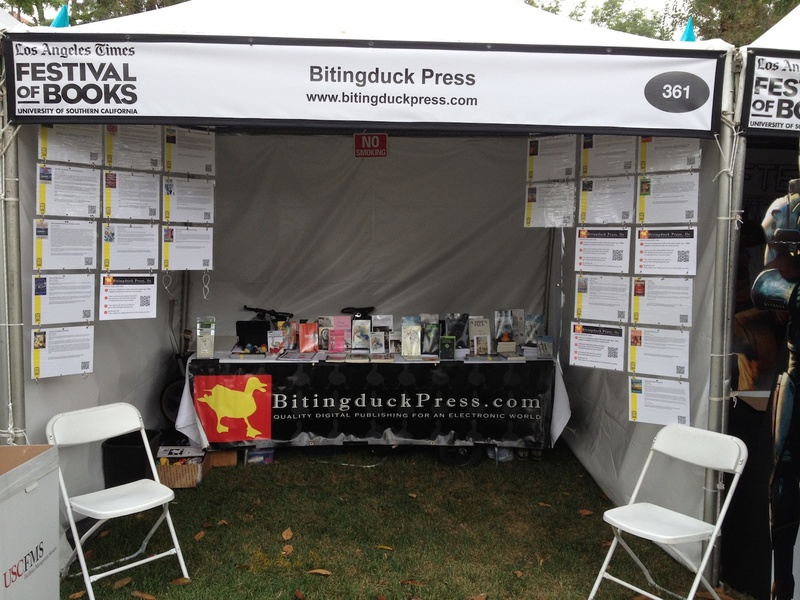 Lots of excitement at the LA Times Festival of Books on the USC campus, April 11-12. We unveiled Advance Review Copies of Billy Tabbs (& The Glorious Darrow) (Mike Michaud), Not Easy Being Green (Susy Gage), and The Mindtraveler (Bonnie Rozanski). 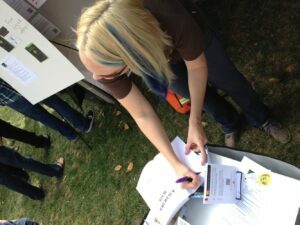 Susy showed up to sign and give away free copies of her first novel, A Slow Cold Death, and to talk about Not Easy Being Green. We also offered a coupon for a free e-book, which seems so far to attract readers of non-fiction; we’ve mostly got requests for The Yoga Facelift and Truly Tricky Physics Problems. Lots of interest in the physics problems, which made us happy! We also met up with old friends and made some new ones. Laura from Krypton radio stopped by and stocked up on ARCs (we hope you like them, Laura!) We also met some aspiring authors with great ideas and some potential cover artists. All in all, a really great year. 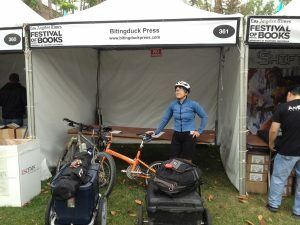 Like last year, we rode our bikes to the Festival, with everything in the trailers. It was an easier ride than last year, since we managed to find the bike path along the 110 this time, instead of getting lost. Susy also showed up on her bike, of course, but that’s to be expected. She rode off with some physics problems in her basket. Chris, nice meeting you last weekend. I wrote a novella and we talked about it. Im having trouble loading into your submission portal, not sure if its working right? Thanks again for being such a cool book publisher.